Late Sunday afternoon was time to go on our guided tour of Cochin. After a stop to view the shore, some shady rain trees, and the Chinese fishing nets (a row of big nets attached to cranes that were once used to mine the Arabian Sea for fish), we moved on the Mattancherry Palace, the former home of the Maharajahs of Cochin. The palace had some of the accoutrements one would expect the Rajahs to have, including incredibly dark teakwood ceilings, royal portraits, swords, fancy costumes made with gold and silver thread, palanquins (man-handled carriages for rajahs and ranees) and howdahs (elephant carriages) and a mural series depicting scenes from the Ramayana. The paintings were very detailed and very colorful, but they left me a bit depressed because I felt that they weren’t being kept in the best of conditions. Photography wasn’t allowed within Mattancherry, yet windows and doors were left open so that the heat and humidity could flow right in. I suppose those are the conditions that Mattancherry has always existed in, but I got the sense that my friends who work in art and art conservation would have been appalled. A little more than a stone’s throw from the palace is a quarter known locally as “Jew Town.” Traditionally, Cochin’s Jews had been protected by the rajahs against Portuguese and Dutch invaders. So, the Jewish community naturally grew up near friendly neighbors. 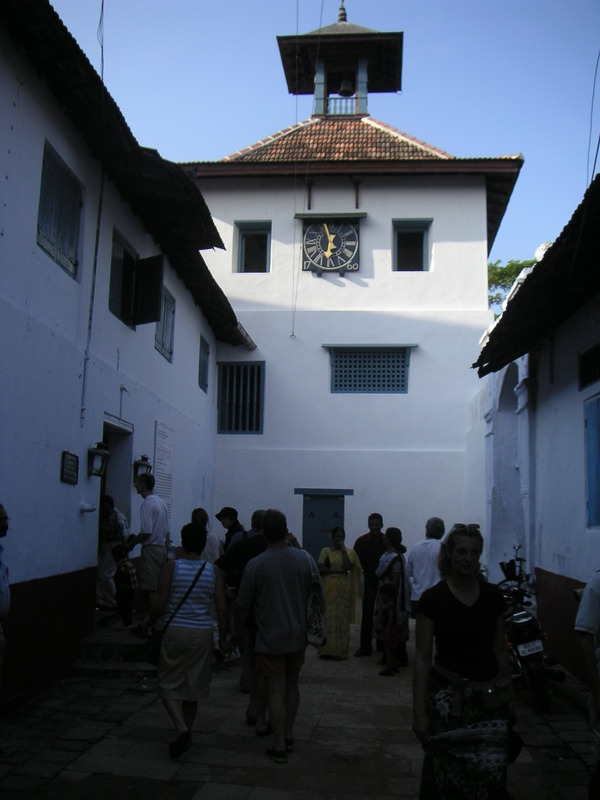 Along with Fort Cochin, Jew Town and its environs are the main tourist area in Cochin. Here you’ll find the spice markets, including the pepper exchange; antique shops selling everyting from black-and-white photos of Indian families, old 45s in Malayalam (the local language in Kerala), brass oil burners, and icons of saints, both Hindu and Christian; and, of course, the Synagogue, the oldest one in India. 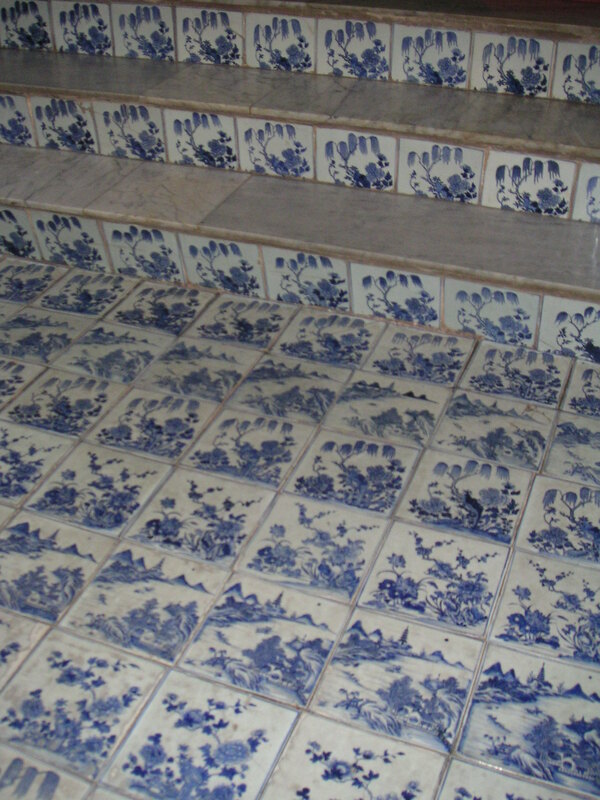 The most striking part of the synagogue – other than its 400-year-old history – are the gorgeous blue-and-white tiles inlaid in the temple floor. They say that no two tiles are alike, but I didn’t have time to do the inspection myself as the synagogue was full of tourists. Our guide was also obliged to take us to the Spice Market, basically a glorified tourist shop, but still packed with good deals on textiles, jewelry, and whole and ground spices. We sipped on some clove and ginger tea while shopping, and ended up buying some white, green, and black peppercorns, some saffron from Kashmir, and an assortment of other gifts. We lingered so long, we were the last customers left by the end of the day. So, for closing out the Spice Market, we received more spiced tea as well as some Keralan Diwali treats from the owner. The sweets from Kerala were much more to my liking than those I’d had in Mumbai. I’ll take coconut flavoring over cardamom any day. Night fell around 6pm and our guide drove us over near the Chinese fishing nets again. It was the last day of the Diwali weekend, so a vast number of families and roving teenagers were strolling down the boardwalk, buying ice cream and paan from the vendors. The mood was festive, even though there was a complete absence of streetlights and everyone was strolling around in the pitch black. Some hours later, as we set out for dinner, we walked back through the area around the fishing nets and it was practically deserted, save for some people waiting at the bus stop near the water’s edge. Rather than staying at our hotel to dine on routine pan-Mediterranean fare, we decided to go out to a mom-and-pop restaurant that several guidebooks had recommended. We thought the restaurant was within walking distance, but Cochin is slightly bigger than it seems. Eventually, after a long, dark walk, we arrived at the Fort House Hotel, a very modest hotel with a covered dining area. There was a group of Belgian, Australian, and possibly French backpackers at one of the picnic tables sharing war stories about mosquito nets. Good sign: we knew the place would be cheap. Even better, I had the Indian food of my dreams at this little place. The menu at the Fort House was small. There were actually more varieties of rice on the menu than actual dishes. As we were in Kerala, we opted for Keralan rice, which was a lot fatter and wetter than your basmati or jasmine types. For dinner, we selected one veg dish – eggplant – and a prawn dish. The eggplant was the best I’ve ever tasted in Indian – mild, creamy, sweet and savory. The closest recipes I could find on the web that seem to match the ingredients in this dish are aviyal (cooked only using eggplant instead of a mixture of veggies) or eggplant bhaji. There was definitely coconut and, possibly, the texture of banana. But the eggplant wasn’t at all gooey. It’s difficult to describe. Our other dish, a delicious shrimp cooked in a spicy tomato sauce, was served on a banana leaf and garnished with slices of pineapple. Both the eggplant and shrimp dishes were sprinkled with fried, julienned onions. Dessert was a fried banana drizzled with honey and a pot of ginger tea. The whole meal cost about $6. Afterwards, we caught an autorickshaw back to the hotel. My first rickshaw ride! In case you’re wondering, the autoricks are basically covered motor scooters (like Vespa Apes) with a small bench inside for passengers. The ricks don’t pick up too much speed, but they were a quick way home. And, in Cochin, they were the only cabs available. About halfway to the hotel, our driver, who was initially smoking something that smelled a bit curious, apologized to us for having had drunk some beer earlier in the night. Then, he proceeded to swerve and barely miss the outer wall of some colonial home. My first rickshaw ride! We were home safely a couple of minutes later, but it was quite a crazy experience. We were scheduled to leave Cochin and Kerala the next morning, but we were unsure if we would make it out. Our hotel had informed us upon our arrival the day before that there would be a strike on Monday and that all stores and businesses would be shut down and traffic would be at a standstill. Apparently, strikes are quite common in Kerala, what with it being a socialist state and all. This particular strike was to be a nationwide strike in protest of the arrest of some swami. I don’t know the exact details, except that it was called by the BJP, the party of India’s former Prime Minister Vajpayee. Luckily, the Hindu Nationalist BJP has much less clout in Kerala than in the north. After all that worrying, the strike was a nonevent. Still, a lot of workers stayed home for the day. Ah…if only Mumbai could be this quiet for once. Of course, we still had one more thing to see before packing up our bags and leaving town: Vasco’s former grave. St. Francis Church, which had been closed on Sunday afternoon, opened again on Monday morning. Anthony and I were the first ones into the church at 9am. And, well, we were a bit disappointed. 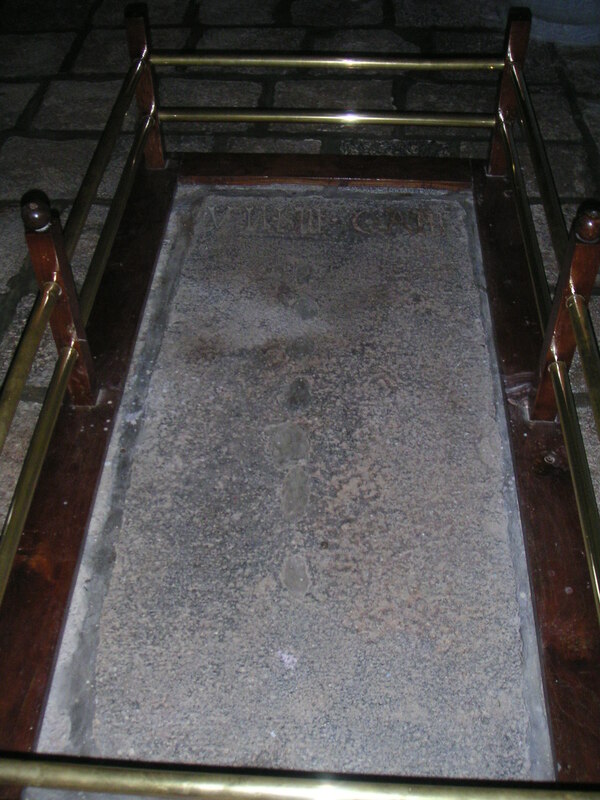 The etching on the stone slab had been worn down completely. Only a brass railing lining the tomb and a small plaque with historical information about the explorer gave us any clue that this was once Vasco’s resting place. Nevertheless, I was pleased to have completed my mission. But I’m glad that I took the time to see the rest of Cochin while I was there.